In the space of a week Scottish football fans have seen a new look start to the season and it’s hard to imagine how interest in any season could be built up with the almost casual kick-about between trial teams. I’m sure every fan can remember ihose Whites versus Blues or Reds versus Stripes trial games that ushered in each season in every ground. Now sponsored football has injected a real bite into the game and before very long this kind of competition will become a must on the calendar. In the past few days the Scottish goal merchants have been hitting the headlines thanks to their consistency last season. In the First Division Celtic cracked home 89 goals with Harry Hood leading the way and championship challengers Aberdeen came up with 68. Joe Harper paying his way with around a third of that total. It’s refreshing to note the last named sides put together 167 goals to claim a Drybrough Cup place and there seems little doubt that forwards in Div II will be all out this season to emulate the pioneers in the new tourney. For clubs like Celtic, Aberdeen, and St. Johnstone the week has given them the perfect chance to get onto a suitable wavelength for coming European clashes. Whatever the outcome of today’s Final. 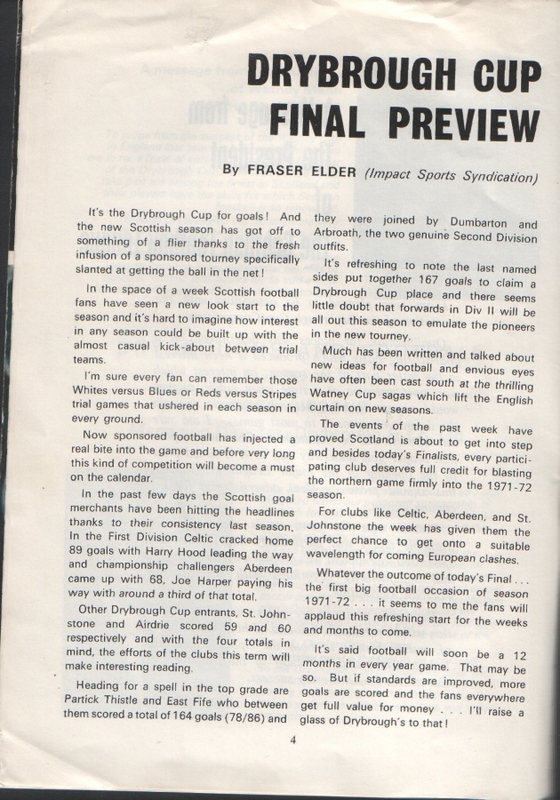 the first big football occasion of season 1971 -72 . . . it seems to me the fans will applaud th,s refreshing start for the weeks and months to come. 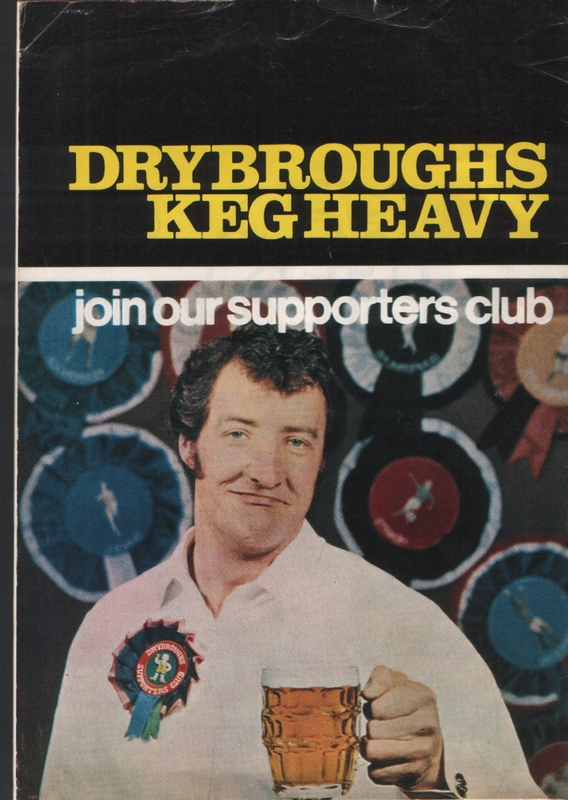 Like a pint of their Keg Heavy, there’s more to the Drybrough Cup Tournament than the inviting froth on the top. It has been a controversial £25,000-worth of valuable soccer sponsorship from the start with not less than £1,000 going to each club. The brew has been challenged, but it survived the Test of an all-club League vote on who should be required to participate. A handsome majority ruled that clubs were compelled to take part. 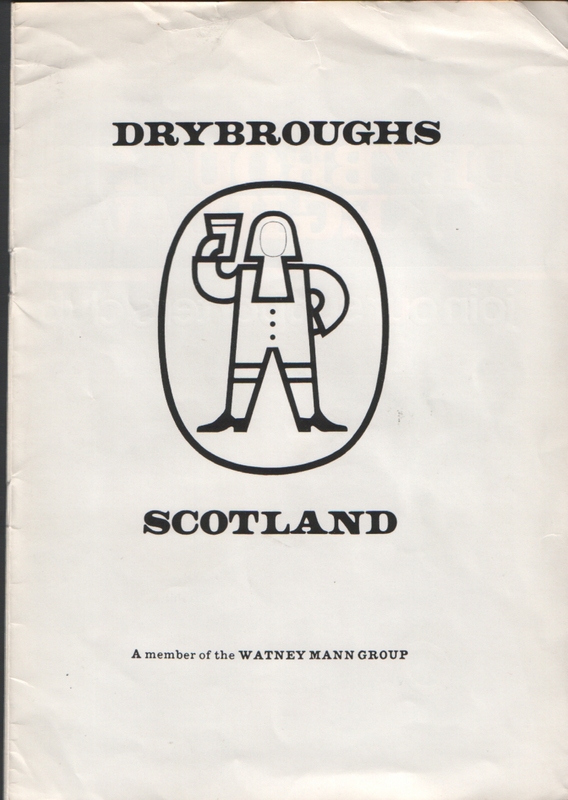 The Drybrough draught has meant well- paid limber-ups as well as welcome buy for clubs like Dumbarton, St. Johnstone, Partick Thistle, East Fife, Airdrie and Arbroath. True, Celtic and Aberdeen have fans enough to live in the style the others would clearly like to become accustomed to-and without sponsorship. But as a general rule the benefactors from the world of business could not be more welcome in the changing world of football. Scottish clubs, sadly. are feeling the pinch because fewer and fewer bids are being made for their players from England. Ally MacLeod. manager of Ayr Utd., who is something of an expert in the currently restricted market, forecasts that there will be even fewer transfer moves in the near future. Dunfermline’s cash crisis would have come years ago hut for the money from transfers hut these ended with the £40.000 they got from Coventry for Roy Barry. Now the Fifers have moved into an austerity age and they, like others, are looking very much to sponsorship. Big clubs like Celtic sce the big advantages of sponsorship for the poorer clubs. This is really the only way sport and business can get along. In my view to try to achieve finalists with the widest appeal by seedings merely to please the sponsor gives a competition a phoney look. There has been nothing like this connected with the zippy, have-a-go Drybrough tournament in which the qualifiers were chosen because of their ability to score goals. It’s goals the fans want most of all with style a close second——and 1 hope that’s what they see in this final. 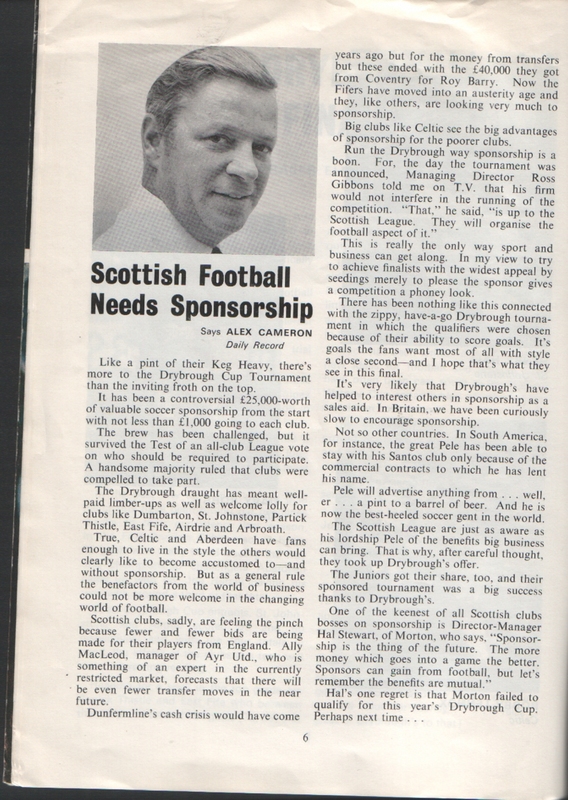 It’s very likely that Drybrough’s have helped to interest others in sponsorship as a sales aid. In Britain, we have been curiously slow to encourage sponsorship. Not so other countries. In South America, for instance, the great Pele has been able to stay with his Santos club only because of the commercial contracts to which he has lent his name. Pele will advertise anything from . . . well, er . . . a pint to a barrel of beer. And he is now the best-heeled soccer gent in the world. The Scottish League are just as aware as his lordship Pele of the benefits big business can bring. That is why, after careful thought, they took up L)ryhrough’s offer. The Juniors got their share, too, and their sponsored tournament was a big success thanks to Drybrough’s. Hal’s one regret is that Morton failed to qualify for this year’s Dryhrough Cup. Perhaps next time . BOBBY CLARK (Goalkeeper). 6 ft. 12 St. Clark is at the moment Scotland’s number one keeper and has represented Scotland in their last five Internationals. First capped in 1967 against Wales, Clark joined Aberdeen from Queen’s Park in 1965 and in that time has proved to be a first class buy. At one stage of his career, it looked as if he was bound for Rangers, but Bobby remained at Pittodrie and is today the established number one. HENNING BOEL (Full-back). 5 ft. 11 ins. 12 St. 7 lbs. Henning joined Aberdeen from American League side Washington Whipps in 1968 and has been an ever present first team man since. A Danish International, he is considered to be one of the toughest full-back’s in the First Division. He won a Scottish Cup medal with Aberdeen two seasons ago. GEORGE MURRAY (Full-back). 5 ft. 11 ins. 11 St. 7 lbs. George joined Aberdeen from Motherwell four years ago and has proved to be a grand buy. Like Boel, George is a tough tackling back and has played a vital part in Aberdeen’s recent successes. George’s brother Cameron is with Second Division side St. Mirren. STEVE MURRAY (Wing-half). 5 ft. 8 ins. 11 St. Steve is Aberdeen’s most expensive signing. Signed from Dundee for a £50,000 fee some 18 months ago Steve played a big part in the Dons near miss Championship run last term and is on the verge of full International honours. One of the finest passers of the ball in Scotland, Murray reads a game well and at 24 has many more years of top class soccer ahead of him. TOMMY McMILLAN (Centre-half). 6 ft. 11 St. 3 lbs. 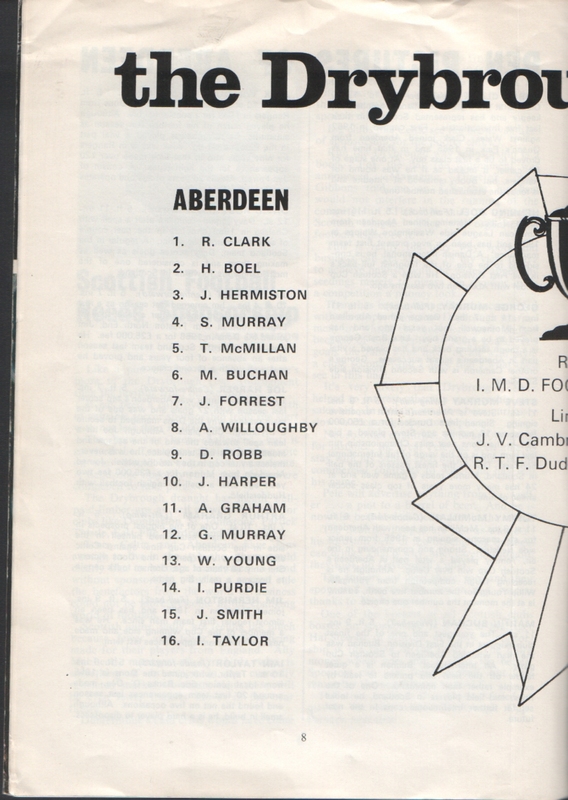 McMillan has been with Aberdeen for six seasons, signing in 1965 from junior side Neilston. Strong and commanding in the air, Tommy played a vital part in Aberdeen’s Scottish Cup win over Celtic. Although he is receiving tough competition from youngster Willie Young for the number five berth, Tommy is at the moment the number one choice. MARTIN BUCHAN (Wing-half). 5 ft. 9 ins. 11 St. The youngest and one of the finest club skippers in the First Division, Buchan was the man who led Aberdeen to Scottish Cup glory An International, Buchan is a quiet fellow off the field and prefers to lead by example rather than command. One of the finest mid-field players in Scotland. he looks set for further International caps in the near future. ALEX WILLOUGHBY (Right-wing). 5 ft. 8 iflS. 10 st. 5 lbs. Alex joined the Dons from Rangers in 1969 for a substantial fee. Although he played much of his football last season as substitute, he nevertheless played a vital part in the Pittodrie set-up. Alex was with Rangers for nine years and in that time made over 120 appearances for the light-blues. A cousin of Jim Forrest. Alex is 26 years of age and operates mainly in mid-field. DAVID ROBB (Inside-forward). 5 ft. 11 ins. 12 St. Davy joined Aberdeen after spell with Chelsea in 1965 and has in the past couple of seasons emerged as a star. A regular in the Scotland team, Davy scores goals as well as making them and is considered one of the most dangerous forwards in Scotland. JIM FORREST (Centie-foward). 5 ft. 7 ins. 10 St. 4 lbs. Jim emerged last season as a real force in the front line. 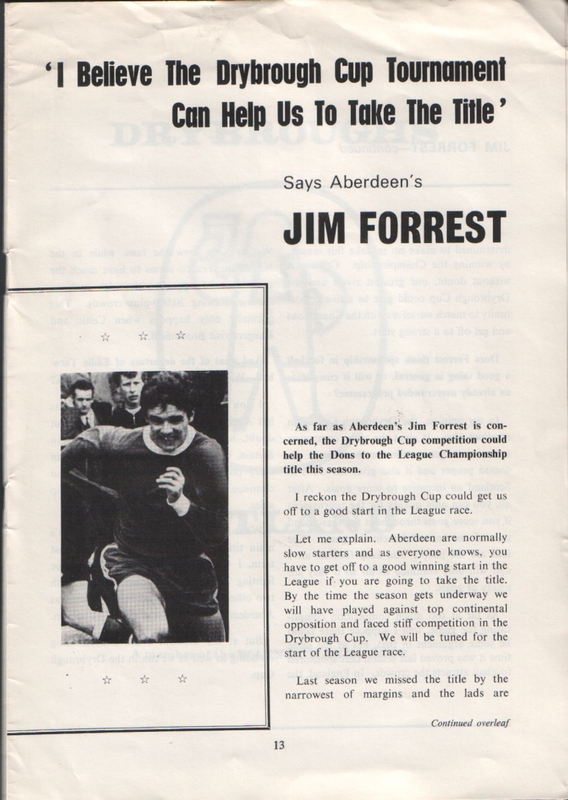 After a lean spell in English football with Preston North End, Jim joined the Dons in 1968 for a £25,000 fee. He was recalled to the Scotland team last season after an absence of four years and proved he was well worth a second chance. JOE HARPER (Centre-forward). 5 ft. 7 ins. 10 St. 7 lbs. Harper was Aberdeen’s top scorer last season with 27 goals and was one of the main reasons why the Dons managed to secure a Drybrough Cup place. Although Joe hit a lean spell towards the end of the season and indeed lost his first team place, he was nevertheless a vital cog in the Pittodrie wheel. Joined Aberdeen from Morton for a £35,000 fee two years ago after a spell in English football with H uddersfield. ARTHUR GRAHAM (Left-wing). 5 ft. 7 ins. 10 St. One of the biggest prospects in Scotland, Graham established himself in the side in the Scottish Cup final against Celtic and played a vital part in the Dons victory. Still only 18 years of age, Graham looks certain to become a really big name. JIM HERMISTON (Full-back). 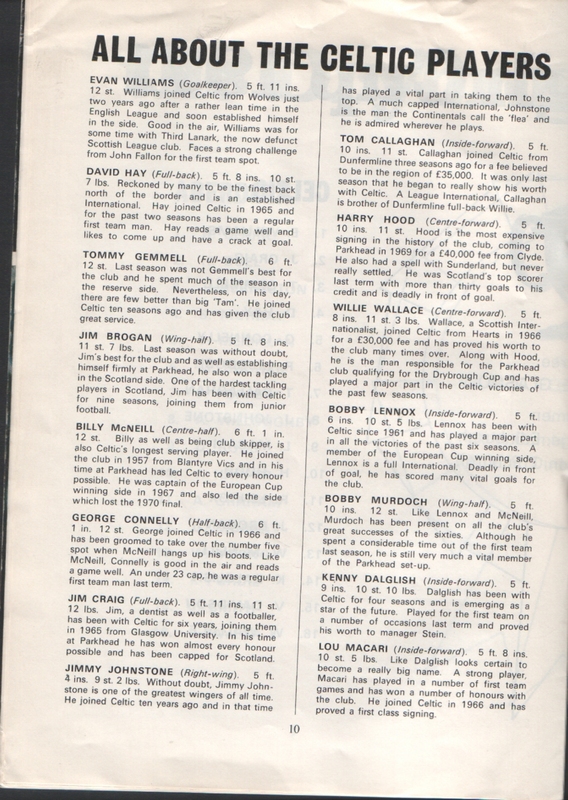 5 ft. 9 ins, joined Aberdeen in 1965, and has been an almost regular first team man since. He was a member of the Cup winning side and made nearly 40 first team appearances last term. lAIN TAYLOR (lnside-forwad). 5 ft. 6 ins. 10 St. Taylor, who joined the Dons in 1965 from local junior side Banks 0’ Dee, made around 20 first team appearances last season and found the net on five occasions Although small in build, he is a hard player to dispossess. EVAN WILLIAMS (Goalkeeper). 5 ft 11 ins. 12 St. Williams joined Celtic from Wolves just two years ago after a rather lean time in the English League and soon established himself in the side. 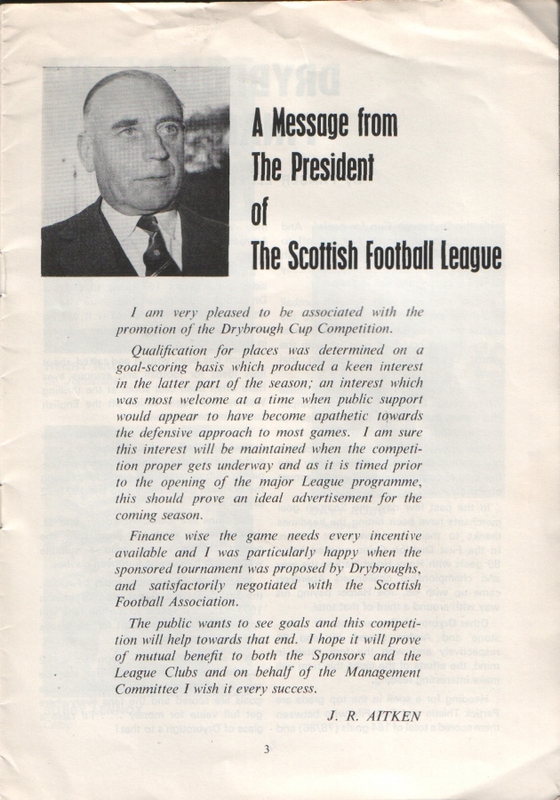 Good in the air, Williams was for some time with Third Lanark, the now defunct Scottish League club. Faces a strong challenge from John Fallon for the first team spot. DAVID HAY (Full-back). 5 ft. 8 ins. 10 St. 7 lbs. Reckoned by many to be the finest back north of the border and is an established International. Hay joined Celtic in 1965 and for the past two seasons has been a regular first team man. Hay reads a game well and likes to come up and have a crack at goal. TOMMY GEMMELL (Full-back). 6 ft. 12 st. Last season was not Gemmells best for the club and he spent much of the season in the reserve side. Nevertheless, on his day, there are few better than big ‘Tam. He joined Celtic ten seasons ago and has given the club great service. JIM BROGAN (Wing-half). 5 ft. 8 ins. 11 si. 7 lbs. Last season was without doubt, Jim’s best for the club and as well as establishing himself firmly at Parkhead, he also won a place in the Scotland side. One of the hardest tackling players in Scotland, Jim has been with Celtic for nine seasons, joining them from junior football. BILLY McNEILL (Centre-ha/f). 6 ft. 1 in. 1 2 st. Billy as well as being club skipper, is also Celtic’s longest serving player. He joined the club in 1957 from Blantyre Vics and in his time at Parkhead has led Celtic to every honour possible. He was captain of the European Cup winning side in 1967 and also led the side which lost the 1970 final. GEORGE CONNELLY (Ha/f-back). 6 ft. 1 in. 12 si. George joined Celtic in 1966 and has been groomed to take over the number five spot when McNeill hangs up his boots. Like McNeill, Connelly is good in the air and reads a game well. An under 23 cap, he was a regular first team man last term. JIM CRAIG (Full-back). 5 ft 11 ins. 11 st. 12 lbs. Jim, a dentist as well as a footballer, has been with Celtic for six years, joining them in 1965 from Glasgow University. In his time at Parkhead he has won almost every honour possible and has been capped for Scotland. 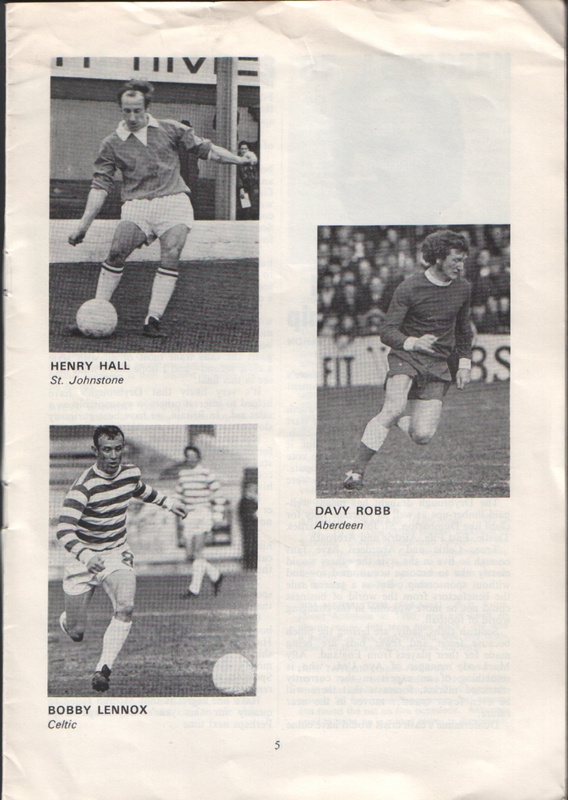 JIMMY JOHNSTONE (R,ghr-wing). 5 ft.
stone is one of the greatest wingers of all time. has played a vital part rn taking them to the top. A much capped International, Johnstone is the man the Continentals call the ‘flea’ and he is admired wherever he plays. TOM CALLAGHAN (lnside-fo,wa,d). 5 ft. 10 ins. 11 st. Callaghan joined Celtic from Dunfermline three seasons ago for a fee believed to be in the region of £35.000. It was only last season that he began to really show his worth with Celtic. A League International. Callaghan is brother of Dunfermline full-back Willie. HARRY HOOD (Cent,edorwaid). 5 ft. 10 ins. 11 st, Hood is the most expensive signing in the history of the club, coming to Parkhead in 1969 for a £40,000 fee from Clyde. He also had a spell with Sunderland. but never really settled. He was Scotland’s top scorer last term with more than thirty goals to his credit and is deadly in front of goal. WILLIE WALLACE (Centre-forward). 5 ft 8 ins. 11 St. 3 lbs. Wallace, a Scottish Internationalist, joined Celtic from Hearts in 1966 for a £30,000 fee and has proved his worth to the club many times over. Along with Hood, he is the man responsible for the Parkhead club qualifying for the Drybrough Cup and has played a major part in the Celtic victories of the past few seasons. BOBBY LENNOX (Inside-forward). 5 ft. 6 ins. 10 st. 5 lbs. Lennox has been with Celtic since 1961 and has played a major part in all the victories of the past six seasons. A member of the European Cup winning side, Lennox is a full International. Deadly in front of goal. he has scored many vital goals for the club. BOBBY MURDOCH (Wing-half). 5 ft 10 ins. 12 st Like Lennox and McNeiII, Murdoch has been present on all the club’s great successes of the sixties. Although he spent a considerable time out of the first team last season, he is still very much a vital member of the Parkhead set-up. KENNY DALGLISH (Inside-forwa,d). 5 ft. 9 ins, 10 St. 10 lbs. Daiglish has been with Celtic for four seasons arid is emerging as a star of the future. Played for the first team on a number of occasions last term and proved his worth to manager Stein. LOU MACARI (lnside-fo,ward). 5 ft. 8 ins. 10 St. 5 lbs. Like DaIglish looks certain to become a really big name. A strong player, Macan has played in a number of first team games and has won a number of honours with the club, He joined Celtic in 1966 and has proved a first class signing. 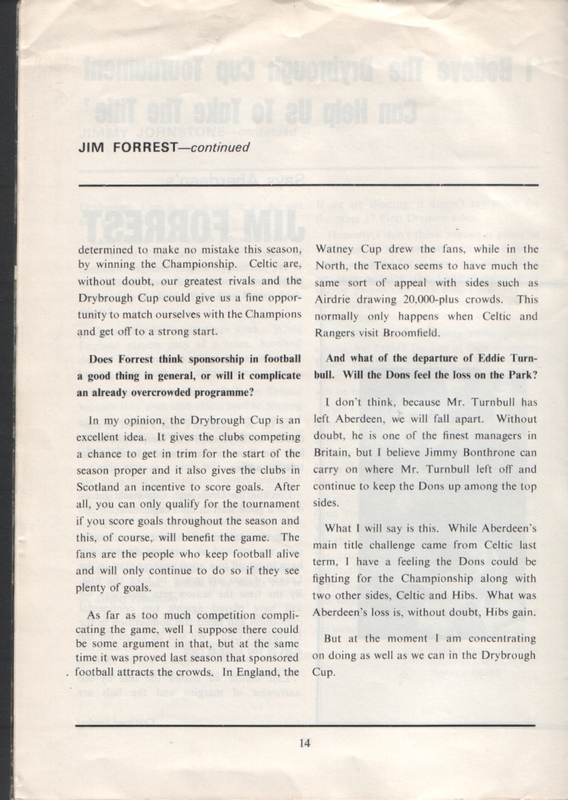 Football in the north has, in the past few years, become a game of defence against defence, according to Celtic star Jimmy Johnstone and he firmly believes the Drybrough Cup could be the answer to combat the defensive outlook. The man on the terracing goes to a football match to see goals. But what does he see’? Defence against defence. It seems more and more sides in Scotland are Concentrating on defensive football. 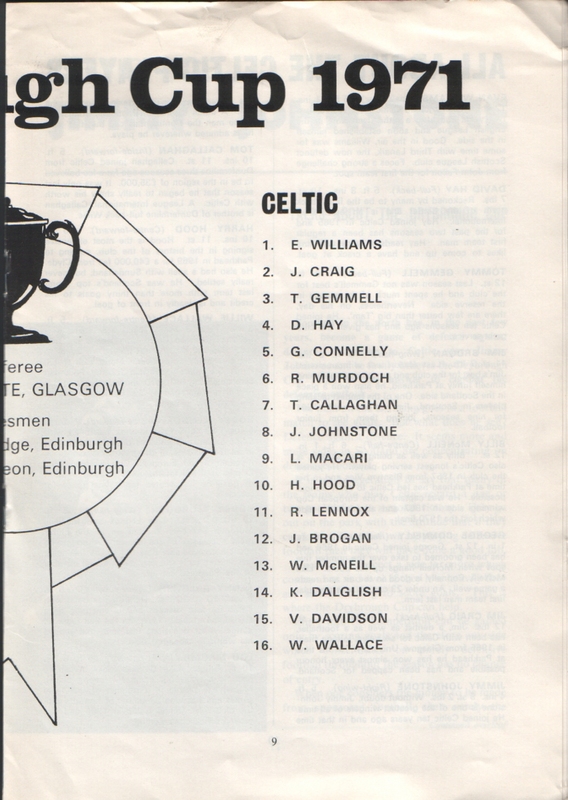 It is no exaggeration to say that many of the teams who play Celtic regard a one or LWO goal defeat as a moral victory. They go out Ofl the park with the attitude that if they can keep the score down by playing defensive tootball then they will have done a good job. I personally respect a side far more which comes at us and even if they lose heavily they are at least trying to score goals. This is where the Drybrough Cup can help. Entry into the competition can be gained only by scoring goals and therefore any side which concentrates on purely defensive football throughout the season has no chance of entry. 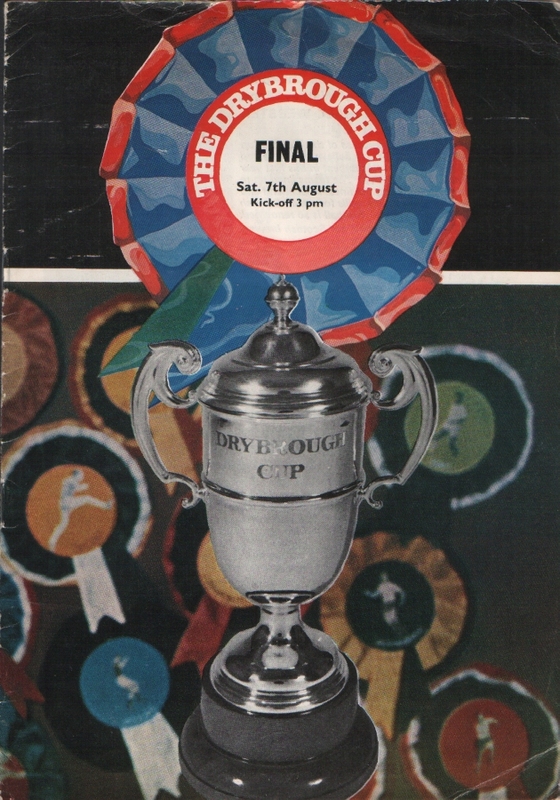 Drybrough Cup is an incentive to go out and get goals. 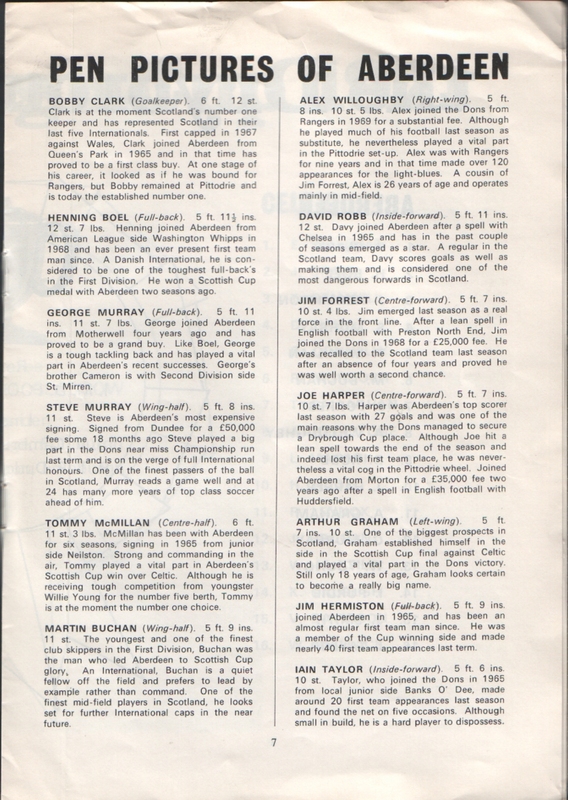 Last season the Scottish sides involved in the Texaco Cup gave a good account of themselves against lnglish opposition, yet at International level Scotland were OflCC again trounced by England. Why does Jimmy think this is? The answer is simple. team work. While England players play as a team, Scotland depend on individual talent and as everyone knows, team work will always win the day. The Scottish sides did well in the Texaco because they were club sides, used to playing as a team, just as the England International side gives the impression of playing as a ‘club side’. Celtic play as a club side. The manager Mr. Stein, has little time for players interested in only themselves and demands that everyone plays for the benefit of the club. This is why Celtic have been successful. They play as a team and have one object in mind— scoring goals. Celtic are as good today as they were five years ago. We won the Championship last season, the Scottish Cup and were beaten finalists in the League Cup and we also reached the last eight of the European Cup. If we are slipping. it doesn’t say much for the other 17 First Division sides. Honestly I don’t think anyone is going to challenge us this season. In my opinion Celtic are good for a long time yet. When we stop winning the Championship then maybe people can turn round and say we are slipping. Rut until that happens. we arc still in front. Aberdeen put in a strong challenge last season, but I think the loss of their manager, Eddie Turnbull, will prove a big blow to them. He is dedicated to the game and it will be hard to replace him at Pittodrie. Perhaps the Dons will come back in a couple of years. but they will take time to gather themselves. 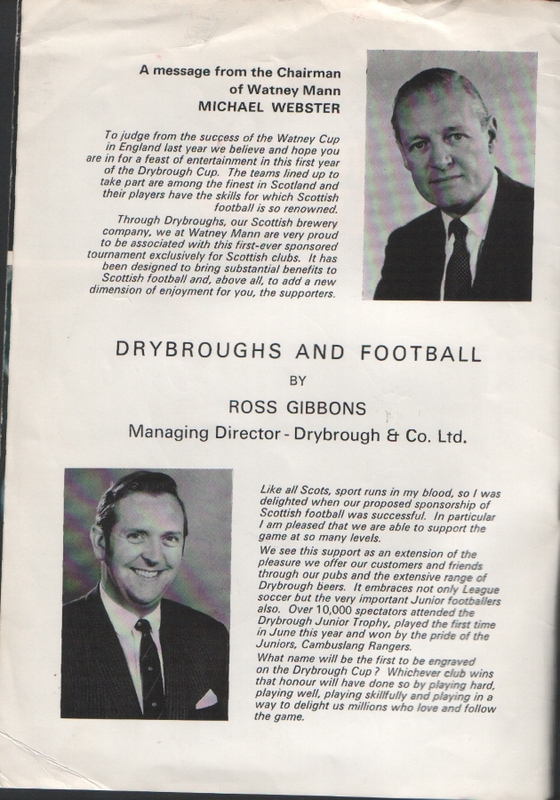 Celtic were originally against taking part in the Drybrough. Why does .Johnstone think this was so? Let’s be honest we don’t need the cash from the competition. But don’t get me wrong. The Drybrough Cup is a good thing for the game and for the smaller teams it has proved to be a first class proposition financially. Perhaps the tournament will also sound the death knell for defensive football in Scotland and if that is so, then as far as I am concerned long may it continue.